The syllable Al- is Arabic for "The", and is attached to the beginning of the word to which it applies. Like English today, or Latin in Renaissance Europe, the dominant language of learned discourse for several centuries was Arabic. Arabic-speaking scholars translated the great works of the Greek philosophers and scientists, as well as studying them in the original, did likewise for the texts of Indian mathematics (from which we derive our modern "Arabic" numbering system), and made important discoveries of their own. Spain was where the worlds of Islam and of Western Christianity met, fought, and mingled for more than seven hundred years, and it is mainly through Spanish that Arabic words have entered the English language. Alcatraz, an island in California famous for its prison, was named by the Spanish explorers for the pelican (Arabic al-qadus, the water carrier), which they wrongly believed to carry water in its bill. In a further misapplication, the word has passed into English as the name for a completely different bird, the "Albatross". Alcove (al-qubbah, the arch) reminds us of the glories of Moorish architecture, as in the Alhambra (or the red house) in Granada. This building was decorated with abstract designs (Arabesques) great intricacy, whose patterns show so subtle a use of geometry and symmetry that they are studied by mathematicians even today. Alfalfa (from the Arabic name for the plant) is grown for hay in dry climates, such as that of Spain. The syllable al also occurs in numerous place names. The Algarve to us is the south of Portugal; to the Iberian Arabs, it was al-Gharb, the West. A very common combination is with wadi, valley, as in Guadalquivir (al-wad al-kebir, the Mighty River, the island of Guadalcanal in the Pacific (named after a town in Spain, wad-al-Kanat, valley of merchant stalls), Guadalajara (wad-al-Hajara or valley of stones) in Spain and Mexico. 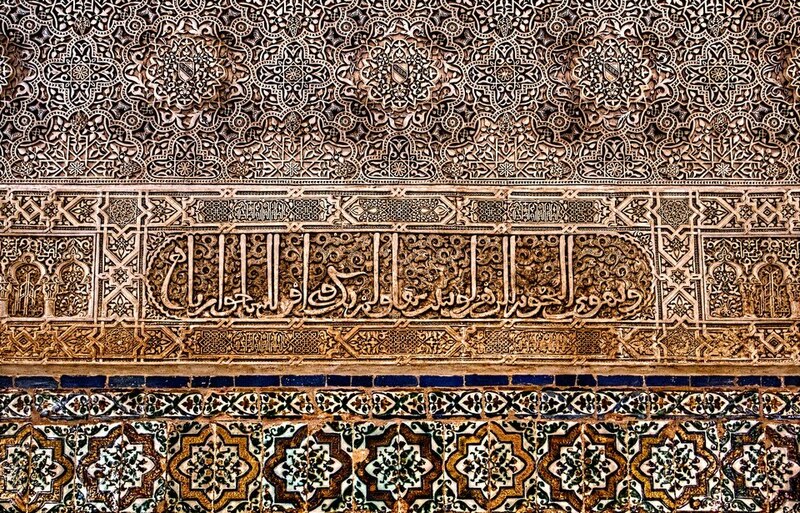 There are even a few Arabic-Spanish or Arabic-Latin hybrid names, such as Alicante (al- tacked onto the Roman name Lucentum, or City of Light) or Guadalupe (wad-al-lupus, valley of the wolf) But most of the Arabic al- words in common English use refer to the Arabic achievements in science and mathematics.